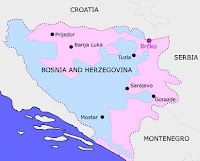 ... 1992 (20 years ago today), The New York Times quoted "senior Administration officials" who said that "'as many as 3,000' Muslim men, women and children were killed in May and June at Serbian-run detention camps near the Bosnian town of Brcko." The report of the atrocity -- said to be the 1st for which U.S. officials had "independent information corroborating" a reported massacre -- coincided with the voicing, by Acting Secretary of State Lawrence S. Eagleburger, of U.S. support for an inquiry. The ensuing U.N. war crimes inquiry commission would be headed by DePaul Law Professor M. Cherif Bassiouni. Have we that kind of agenda? Why come to the ASIL Midyear Meeting? Athens. Write On! "Guantanamo Bay: What Next?"